Set amidst 75 acres of beautiful park and natural bushland with lake and vineyard views, Eight Willows Retreat offers you a tranquil retreat from the hustle and bustle of everyday life. Take a leisurely walk around the property or through our 30 acres of beautiful bush land or sit and watch the kangaroos at sunset with a glass of wine. Located centrally to Margaret River, Dunsborough and Busselton, Eight Willows Retreat is ideally situated to take in all that the Margaret River Wine Region has to offer. Here at Eight Willows Retreat our exclusive wedding packages form a unique partnership to bring you the region’s best event management and accommodation, food & beverage and event styling to create the perfect 'I do'. Our friendly team co-ordinate all of the magic required; from bridal party and guest accommodation, to ceremony set up, reception styling and catering. Eight Willows Retreat provides our couples with creative stylists, photographers, wedding suppliers and local produces to provide one complete package, relieving you of wedding planning pressures. Situated in the heart of Margaret River’s vast wine region on Metricup Road, just North of Margaret River and South of Busselton and Dunsborough; Eight Willows Retreat is a picturesque property surrounded by the iconic South West Jarrah forest. With exclusive use of the retreat from ceremony and reception through to modern 4.5 Star self-catered accommodation; set within 75 acres of natural forest, parkland and lakes, overlooking the adjacent Celestial Bay vineyards, Eight Willows Retreat has all the elements to create a truly memorable wedding with a ceremony merely metres from your reception venue, making the transition from ceremony to celebration seamless. 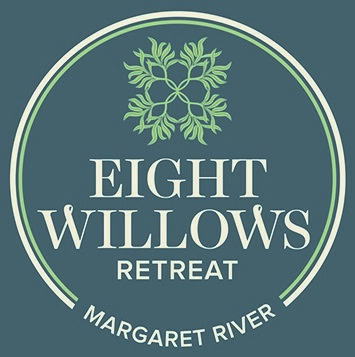 Eight Willows Retreat is an AAA 4.5 star rated self-catered luxury retreat located within the hear of the Margaret River region. Our choice of One Bedroom King Bed Chalets & 2 Bedroom Chalets offer views across the retreat such as our lake, vineyard & forest views. Set amongst 75 acres of natural bushland we are the perfect retreat from the hustle and bustle of everyday life. Our rammed earth Two Bedroom Queen Bed Chalets compliment the natural bushland they are set in. With a Queen Beds as standard in both the Master & Second Bedroom they are perfect for families or couples looking to explore the Margaret River region. These Chalets come with an open style kitchen equipped with modern appliances and fitted out with everything you need to compliment your stay. The spacious living and dining area comes with a large Flat Screen TV with Foxtel and a gas log fire. and either a separate shower or shower over the bath. to the living room and can sleep a maximum of 4 people with use of the Sofa Bed. The spacious bathroom has a shower and a separate Spa Bath. The European style kitchenette is equipped with modern appliances and fitted out with everything you need to compliment your stay. The comfortable living area comes with a large flat screen TV with Foxtel & DVD player on request. All Chalets come equipped with washing machine and dryer and a private veranda with views across the retreat. Our rammed earth Two Bedroom Queen & Twin Bed Chalets compliment the natural bushland they are set in. With a Queen Beds as standard in the Master Bedroom and Twin Beds in the Second Bedroom they are perfect for families or couples looking to explore the Margaret River region. with a large Flat Screen TV with Foxtel, DVD player on request and a gas log fire. Our 2 Bedroom Queen & Twin Bed Chalets come with a large family sized bathroom with a large bath and either a separate shower or shower over the bath. The luxuriously appointed self-contained Two Bedroom, King Chalets feature a master King bedroom with wardrobe and en-suite bathroom and a second open plan King bedroom and wardrobe adjacent to the kitchen/ living room and a large separate bathroom with a walk-in shower and Spa Bath. The European style kitchen is fit out with modern appliances & equipment, a medium sized fridge and comfortable living area with a dining table and large flat screen TV with Foxtel. All Chalets are equipped with a washing machine, dryer, free-standing BBQ and table setting on the outdoor veranda. Please Note: One Chalet consists of Special access facilities in the second bathroom, where no spa bath exists. Eight Willows Retreat reception is open daily from 8.00am until 5.00pm. If guests arrive to check in after 5.00pm please advise via telephone or email and we can arrange for a self check in.